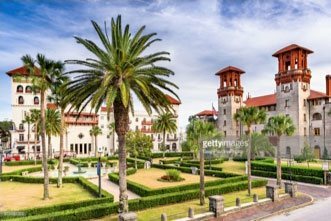 For the couples who want to skip the muss and fuss of a large wedding, St. Augustine is the perfect alternative! Our historic downtown district and idyllic beaches set the perfect romantic backdrop for any couples on vacation. Weddings are meant to celebrate the love of a couple, which can quickly get lost in the hectic planning of a grand ceremony. If you’d rather keep it intimate, we at Agustin Inn are happy to help however we can. Whether you’re hoping to have a small affair on the sand or a courthouse ceremony, your St. Augustine elopement is sure to be a beautiful one! After your St. Augustine elopement, it’s time to enjoy the town as a newly married couple! Access our free Vacation Guide for a great list of things to do during your stay at Agustin Inn. Discover our favorite restaurants, historic sites, museums, and hiking spots. Our St. Augustine Vacation Guide is entirely online, so it’s easy to access from any mobile device. Take all the guesswork out of planning your trip by using our Vacation Guide! If you’re planning on getting a St. Johns County marriage license, there are a couple things you need to know! Both parties must be present and have picture identification and your social security number. If either or both parties aren’t U.S. residents, then a valid passport will do. Florida State requires that a Family Law Handbook is read prior to the issuance of the license. If you are a Florida resident, you are required to take an approved marriage class or be subject to a three-day waiting period. If you’re looking for a wedding planner, you’re in luck! There is an abundance of great local companies that are happy to help you organize your St. Augustine wedding. If you’d rather plan it yourself, you’ll need to get a permit for a beach wedding. You have a couple different choices for beaches. Anastasia State Park, a park just 13 minutes from Agustin Inn, allows weddings to be held on the grounds. You can also request a permit from the City of St. Augustine Beach or Fort Matanzas National Monument. You really can’t go wrong with any of these choices! While you’re getting your marriage license and permits all squared away, let us worry about making your stay at Agustin Inn a special one! 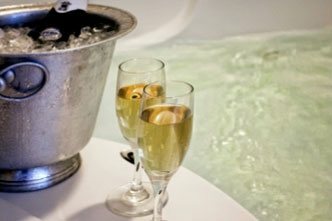 We have two packages available that are perfect for couples. The first is the Ultimate Romance Package. This package includes a private horse and carriage ride, a half-dozen chocolate-covered strawberries, champagne on ice waiting for you in your room, a dozen assorted roses, and a flameless candle to set the mood. You can also choose the Agustin Classic Romance Package, which includes a private horse and carriage ride from the Inn, a half-dozen assorted roses, a half-dozen chocolate-covered strawberries, and a gift certificate to one of St. Augustine’s signature restaurants. No matter how you choose to have your St. Augustine elopement, choose to stay at Agustin Inn. Our historic Inn is the perfect place for such a special affair. We are dedicated to making sure that your incredible day goes smoothly. Our most romantic room, Camelot, is the perfect accommodation for your big day! This is one of our most popular rooms, located in the original structure on the second floor. 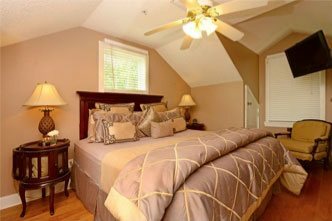 It features a luxuriously comfortable King-sized bed and a brand-new Jacuzzi and shower combo. You’ll love looking out from the private balcony onto the gorgeous historic district of St. Augustine. 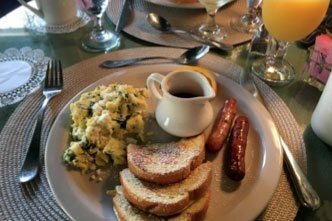 The morning after your ceremony, enjoy your first breakfast as a married couple right here at Agustin Inn! Enjoy two delicious courses designed around fresh and local ingredients. If you have any dietary restrictions, please do not hesitate to let us know. We are happy to accommodate.